He won us the game! Maul him! 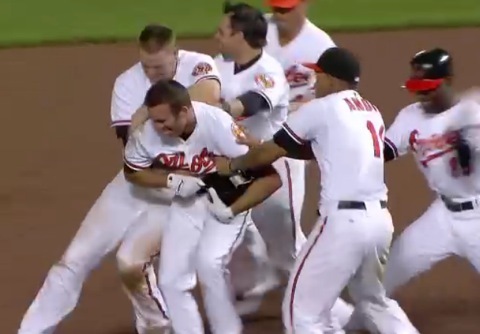 Moving the Needle: J.J. Hardy comes up with the walk-off single, +.463 WPA. This game came in two acts. First was regulation, in which the two pitchers dueled to a stalemate. The second was a series of one-inning playoffs. The Mariners struck first, scratching across a run in the top of the third playoff. They went to their closer, since it they were on the road and it was no longer a tie game. Brandon League immediately allowed a single and then plunked two straight batters. His shortstop, Luis Rodriguez, who absolutely deserves a mention, saved at least a run, and maybe the game, with a diving catch on a line drive. League wouldn’t get so lucky with Hardy at the plate. He grounded one up the middle and brought both runners home. Both acts were rich entertainment. Justin Vargas: 9 IP, 7 H, 0 R, 1 BB, 4 K, 12 GB. Coming into the game Vargas had an ERA inflated by a couple of bad starts. But in four of his seven starts he allowed two or fewer runs. That ERA dropped from 4.68 to 3.87. Despite the eight base runners, he never really got too deeply into trouble, which, I suppose, is why he was able to hold them scoreless for nine. Zach Britton: 9 IP, 3 H, 0 R, 0 BB, 5 K, 12 GB. Game Score goes to Britton on this one. He faced 29 batters and only used 108 pitches to get through those nine innings. In five of his eight starts he has given up 1 or zero runs, combining for a line of: 34.2 IP, 20 H, 3 R, 3 ER, 11 BB, 16 K, 52 GB. 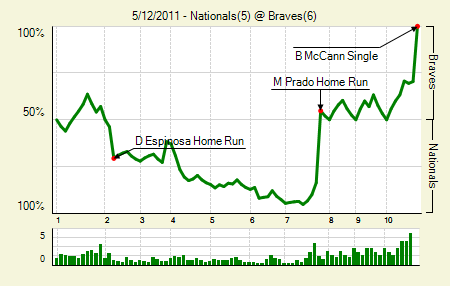 Moving the Needle: Martin Prado hits a granny in the seventh to tie the game, +.384 WPA. Jordan Zimmerman had pitched a fine game for the Nats, striking out 11 in six innings. He came out for the seventh, but after recording the first out he allowed to straight to reach base. Jim Riggleman called for the lefty Sean Burnett, who walked a batter and then, on his ninth pitch to Prado, surrendered the game-tying home run. The homer set up an extra inning win for the Braves, which was much needed after a pair of rough losses to open the series. Also, watching the replay of the seventh inning makes me wonder how Braves fans can stand Chip Caray as the play-by-play guy. Nate McLouth: 2 for 4. He hasn’t had an extra base hit since I (apparently) jinxed him. Danny Espinosa: 1 for 3, 1 HR, 1 HBP. He doesn’t have many hits, just 26 in 124 AB, but 11 of them have gone for extra bases. Moving the Needle: Reid Brignac goes for extra bases at an opportune time, +.170 WPA. Coming into yesterday’s game, Brignac had come to the plate 87 times and had recorded only 15 hits. None of them had gone for extra bases. But he made the first one count. In the second inning he came up with the bases loaded and on a 1-0 pitch he sliced one down the left field line. He apparently thought it was foul, as he kind of just stood there for a moment. It didn’t change much, since the runner from first held up at third. It gave the Rays a 2-0 lead and set up another two runs in the inning. James Shields: 7 IP, 7 H, 2 R, 2 ER, 1 BB, 7 K, 1 HR. He has allowed more than 2 R in just one of eight starts this season. Casey Kotchman: 2 for 4, 1 BB. Just five of his 27 hits on the season have gone for extra bases, yet his wOBA up around .400. A .369 BABIP will to that for ya. 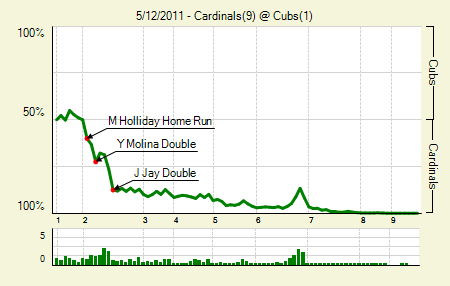 Moving the Needle: Jon Jay busts the game open with a bases loaded double, +.111 WPA. 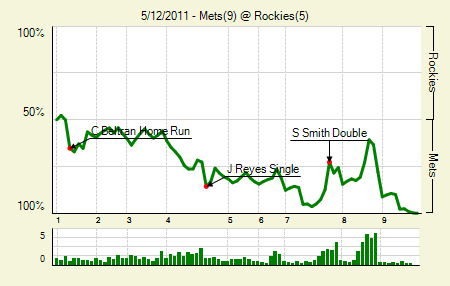 For some nerdy entertainment, check out the play log, specifically the final few innings. 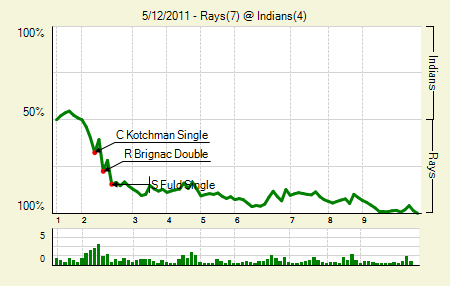 Not much movement there, which is what happens when you go up 9-1 in the seventh. The Cardinals started early, scoring five runs in the second. The biggest hit came off the bat of Jay, who lined a double down the right field line to make it 4-0. The Cardinals kept piling on, denying the Cubs a chance to make this one a game. Jaime Garcia: 7 IP, 9 H, 1 R, 1 ER, 1 BB, 4 K, 14 GB. Another typically solid outing from Garcia. Matt Holliday: 2 for 4, 1 HR, 1 BB. Is it just me, or does he have the quietest .450+ wOBA in the league? Moving the Needle: Eric Hosmer hits his second career home run, +.094 WPA. This week we learned, unsurprisingly, that Hosmer, per agent Scott Boras, will not seek a contract extension in Kansas City. This week Hosmer hit two home runs, the first two of his career, at Yankee Stadium. You see where I’m going with this. In any case, the Royals had a field day in the series finale, putting up six runs in the second and eight before starter Ivan Nova exited in the fourth. The Yanks made an effort, but they couldn’t get much going outside the fifth inning. Hosmer’s blast got things started. He added an RBI double later in the game. Billy Butler: 4 for 6, 1 2B. He was 0 for 6 in the series before last night. Melky Cabrera: 2 for 5, 1 2B, 1 HR. Not a bad way to remind your former team of what they’re missing. He hit two homers in the series. Alex Rodriguez: 1 for 4, 1 HR. His eighth inning homer was his first since April 23rd. Moving the Needle: Carlos Beltran stakes the Mets to an early lead with a two-run homer, +.151 WPA. Selfish Beltran hogs the main section all to himself. His first homer — yes, his first — was a long shot to dead center, and it put the Mets up 2-0 in the first. He struck again in the seventh, turning a 5-2 lead into a 7-2 lead with another two-run shot. And then, in the ninth, after the Rockies battled back to make it 7-5, Beltran hit another two-run shot to cinch the win for the Mets. Selfish, selfish Beltran, hitting those homers that helped his team win. Jonathan Herrera: 2 for 5, 1 HR. He’s slipped, but just a little bit. It’s to be expected, of course. There weren’t really any other notables. The game was all Beltran. 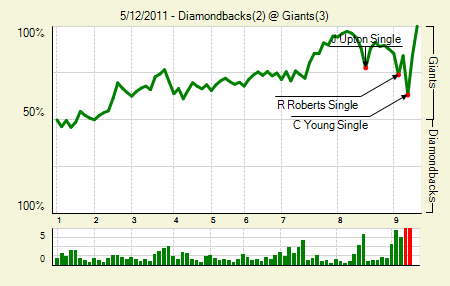 Moving the Needle: Chris Young moves the tying run to third in the bottom of the ninth, +.210 WPA. That’s quite a huge swing for a non-scoring play, though it did mean the Diamondbacks could have tied the game with an out. But Javier Lopez came back to strike out both Kelly Johnson and Gerrardo Parra to end the game. In fact, I’m being a little generous giving the spot to Young. 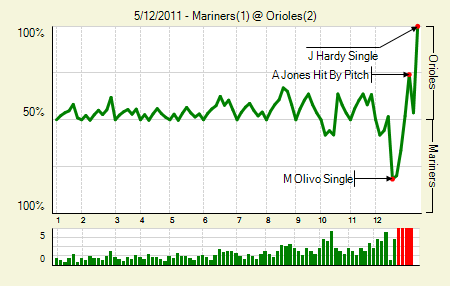 Johnson’s strikeout was actually -.214 WPA, and understandably so — the LI of his at-bat was 6.30. He took away the ability to score on a sac fly, so yeah, it’s understandable why that was such a huge swing. Matt Cain: 7.2 IP, 7 H, 2 R, 2 ER, 1 BB, 7 K. When I was looking at highlights of this game I saw one labeled “Cain’s injury.” Geeze, I thought. And I watched it, and yeah, Cain got hit by a pitch and the trainers came out to check his hand. This happened in the bottom of the seventh. What the highlight tag failed to mention was that Cain came out to pitch the eighth. Eli Whiteside: 2 for 4, 2 2B. He didn’t get a mention above, and, well, two doubles from a backup catcher is pretty notable. 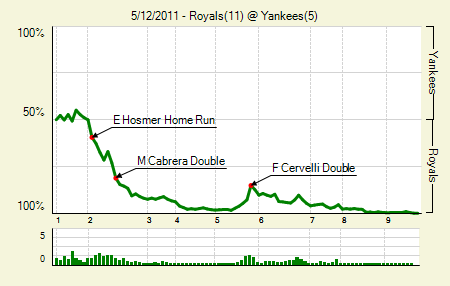 We hoped you liked reading The Morning After: Game Recaps for May 12th, 2011 by Joe Pawlikowski! Do Prospect Busts Ever Reach Their Potential? Where have you gone, Boog Sciambi? Seconded. I hate that guy. Hate, hate, hate, hate that guy! He really is a walking parody of bad play-by-play announcers. I appreciate that he’s part of the Caray commenting dynasty, but he is really not a good play-by-play guy. Nothing beats his “PRESTIDIGITATION FOR ANDY PETITE!” in the ALCS a few years ago. I still long for the days of Pete Van Wieren, Skip Caray, Don Sutton, and Joe Simpson working every game for TBS. That’s the sound of summer for anyone who was a Braves fan prior to 2004.